14 Piece Chemistry Spice Rack Set - Moar Stuff - You don't need it but you know you want it. $39.99 $57.95	Get Your Stuff! The test tube spice jars and flasks in this 14 Piece Chemistry Spice Rack Set will make your kitchen look like it belongs in the chemistry building of your local university. It’s a great gift for academics or just for anyone who likes to “experiment” in the kitchen. This attractive set includes 9 test tubes with stoppers, three lab flasks, a 10-ounce flask with stopper/pouring spout for oil, and a convenient metal tray for carry and storage. The set includes the following labels for your spices: Ch-Chile, Cu-Cumin, Tu-Tumeric, Ci-Cinnamon, Ga-Garlic, Mu-Mustard, Ba-Basil, Or-Oregano, Pa-Paprika, Su-Sugar, Pe-Pepper, Sa-Salt (yes, it should be Na, but notice the theme!). 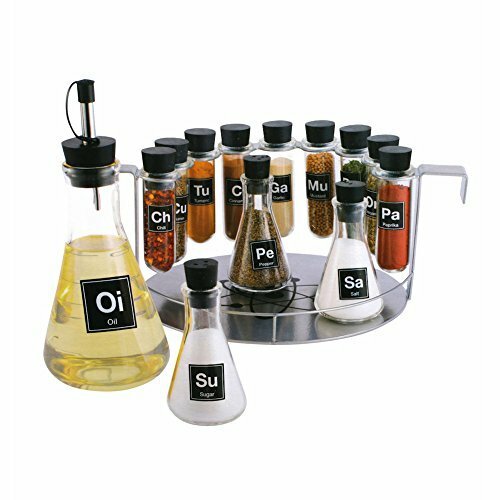 So, get yourself this awesome 14 Piece Chemistry Spice Rack Set and start exploring the chemistry of cooking! Dimensions: 10.7 x 9 x 4.4 inches. Test tube Dimensions: 3 inches tall x 1 inch diameter. Small Flask Dimensions: 3.25 inches tall x 1.9 inch diameter. Large Flask Dimensions: 5.75 inches tall x 3.25 inch diameter. Set 14 Chemistry-lab themed spice containers. Includes 9 test tubes/ 3 smaller lab flasks 1 large flask for oil. Also includes a metal rack for storage. Includes labels, But not spices or oils. The glass is dishwasher safe but, because of the labels, you should hand wash them.